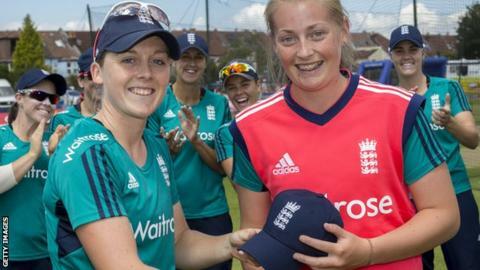 Uncapped bowlers Beth Langston and Sophie Ecclestone are in the England women's squad for their five-match one-day tour of the West Indies next month. Loughborough Lightning's Langston, 24, who made her Twenty20 international debut in the Windies in 2013, is named despite recently breaking a thumb. Lancashire Thunder spinner Ecclestone, 17, played in two T20 games against Pakistan in July, taking three wickets. Batter Fran Wilson is ruled out after breaking a finger in training. Aside from Wilson, the only players who featured in the summer limited-overs series against Pakistan to miss out on selection for the Windies are seamers Natasha Farrant and Kate Cross, as England have included four front-line spinners. All five matches will be played in Jamaica, with the last three counting towards the ICC Women's Championship which determines qualification for next year's Women's World Cup in England - and Heather Knight's side would clinch one of the four automatic World Cup places if they win all three of those designated games. BBC Radio 5 live sports extra will have ball-by-ball commentary on all five matches. Squad: Heather Knight (capt), Anya Shrubsole (vice-capt), Tammy Beaumont, Katherine Brunt, Sophie Ecclestone, Georgia Elwiss, Jenny Gunn, Alex Hartley, Danielle Hazell, Amy Jones (wk), Beth Langston, Laura Marsh, Natalie Sciver, Lauren Winfield, Danielle Wyatt.